Virginia Energy Resources Inc. (TSX.V: VAE) (OTCQX: VAERF) is pleased to report that the National Academy of Sciences (NAS) study was released today and concludes that by employing best practices that have been in place in the uranium producing districts of Canada and the United States for the past twenty years will provide sufficient mitigation of environmental and health concerns in Virginia. "The study provides a clear road map for creating safe uranium production at Coles Hill," said Walter Coles Jr., President and CEO of Virginia Energy Resources. "The study shows that major technological and regulatory advances over the past 30 years have dramatically improved the environmental and public health performance of the uranium mining and milling industry," Coles continued. "We are committed to adopting the best practices and regulatory requirements identified by the NAS to ensure protection of the environment and public health." 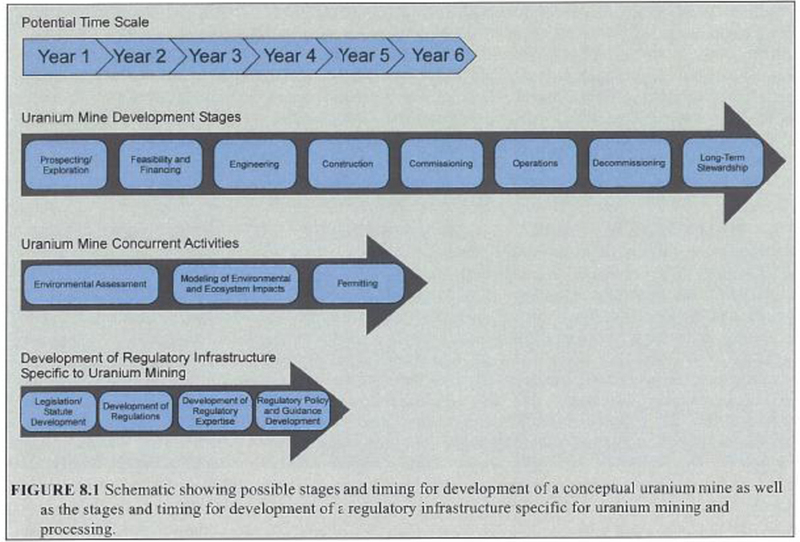 The report, in particular, provides the road map for how Virginia can design a regulatory structure to provide oversight for safe uranium mining. The recommendations rely heavily on the track record of modern uranium mining operations in Canada and the United States, which have been proven successful at managing many of the environmental and health risks associated with the industry. The report singles out the impact of lined, below-grade tailings disposal and improvement of underground ventilation as having a significant impact on preserving water quality and worker safety. "We fully intend to implement these state-of-the-art practices at Coles Hill," commented Coles. Ensure that the life-cycle costs as well as long term stewardship needs are reflected in the type of, and amount of, the financial surety. Ensure that inspection and enforcement tools are transparent, practical, sufficient, available, independent and sustainable. While the development of this new regulatory structure could be based on existing laws, the optimum approach would be for an entirely new mining, processing and reclamation law or laws be enacted. Effective interagency integration and coordination. Active engagement in the regulatory processes of the U.S. Nuclear Regulatory Commission and the U.S. Environmental Protection Agency to ensure good federal/state coordination. Additionally, considerable international expertise and knowledge in regulatory best practices should be sought. Include the modern best practice of requiring an environmental impact assessment prior to the commencement of any mining activities. The NAS report acknowledges that after the moratorium is lifted it will take a number of years before the Coles Hill project could receive all the necessary permits to begin operating. This proposed timeline in the NAS study is not a set-back for the project but well within the normal time-frames for a mining project of this nature. "Our company is confident that this lengthy timeframe will allow the General Assembly, state and federal agencies and community residents to thoroughly examine every aspect of this issue and make sure that regulations are in place and best practices are fully adopted to protect the health and well-being of our community," said Coles Hill Project Manager, Patrick Wales. Figure 8.1 from the NAS report identifies a potential timeline for the project. The NAS report comments that "tailings impoundment sites will be safe for at least 200 years..." Wales added "that the underlying geology at the Coles Hill site is a very hard granite rock, which has remained unchanged for the last 400 million years. This kind of setting will help ensure the safety and maintenance of our tailings facilities beyond the 200-1,000 year requirement specified by the Nuclear Regulatory Commission." The NAS study notes that "analyses of the Coles Hill uranium deposit suggests it is relatively low in sulfide minerals (0.04-0.05%)," thus the risk for acid rock drainage from the tailings or overburden is substantially reduced. The study findings were presented to the Uranium Mining Subcommittee of the Virginia Coal & Energy Commission by the study committee's chair, Dr. Paul Locke, Director of the Public Health Program and Department of Environmental Health Sciences at the Johns Hopkins University Bloomberg School of Public Health. "It is clear from what we heard today that the committee took a serious look at the lessons learned from the history of the uranium mining industry around the world and sought to apply those lessons to the direction Virginia should take in the future," said Coles. "As a company, we are dedicated to absorbing those lessons and ensuring that the mistakes of the past are not repeated in Virginia. That is why we have committed our company to learning all we can about the best, most effective practices used around the world to protect our workers and safeguard the health of our community."